Despite Ukraine’s relatively open system of education for residents in separatist territories, the war and economic crisis in the region create unavoidable problems for those in education. (c) Adam Davy/EMPICS Sport/PA Images. All rights reserved.The armed conflict broke out in eastern Ukraine at the end of the 2013-2014 academic year — just before students were to take their final exams. Universities, colleges and schools were preparing to hand out diplomas and certificates to successful candidates. But over the summer of 2014, local skirmishes turned into full-scale hostilities. A referendum was held in the areas controlled by separatist forces on independence for the two self-styled republics, the so-called Donbas People’s Republic (DNR) and the Luhansk People’s Republic (LNR). These new political entities mostly copied the existing Ukrainian system of government, and thus Ministries of Education appeared in both republics. I spoke to more than 20 students and teachers from both sides of the divide. Many of them talked about the increase in mutual intolerance and alienation among people living in the conflict zone. Most of them saw war, poverty, corruption and the systematic degradation of the social and humanitarian institutions — as well as propaganda from both sides — as the main obstacles to resolving the situation. During the unrest sometimes referred to as the “Russian Spring”, supporters of independence for the so-called DNR and LNR seized the administrative buildings and offices of not only the Ukrainian Special Services, but civil establishments as well. On 10 September, 2014, gunmen seized buildings belonging to Donetsk National University (DonNU). The attack was led by pro-Russian political specialist Sergey Baryshnikov, who until 2013 taught political science at the university’s history faculty. A similar story happened at another important higher educational establishment: Nikolay Boiko, Donetsk’s self-proclaimed mayor and a local separatist leader, was appointed pro-rector of Donbas State Technical University (DonGTU) in Alchevsk, in the Luhansk region. 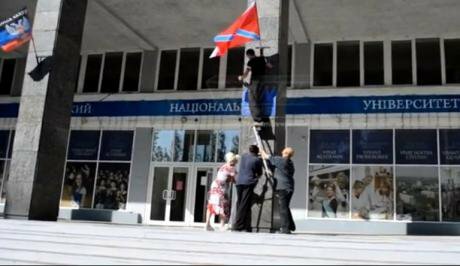 Changing the flag at Donetsk National University. Source: AnnaNews.Two months earlier, Ukraine’s Treasury had cut off funding to the separatist-controlled areas. University staff were left without salaries, students without grants and the universities themselves were left with budget deficits and debts. The government arranged for DonNU teachers to transfer to Vinnytsia, in central-west Ukraine, but some preferred to stay in Donetsk. In the Donbas, the start of the academic year was postponed for a month, but the short anti-terrorist operation (ATO) promised by Ukraine’s president Poroshenko in his election campaign failed to materialise. In November 2014, Ukraine’s National Security Council decided to evacuate all government bodies and banks out of Donbas. By that point, the breakup of the universities was more or less complete. Key positions were occupied by people loyal to the separatists, and teaching staff were divided along ideological lines, some supporting the idea of Donetsk and Luhansk’s independence from Ukraine, others keen to maintain the territorial integrity of their country. Irina worked at one of Donetsk’s universities, but left the city in the summer of 2014 after threats from pro-Russian colleagues. She asked me not to give her last name, as she is still afraid of harassment. She now teaches English language courses, but doesn’t want to return to work at a university — the salary would be too low to pay her rent. Kvit tells me about a general scheme that was developed to help universities transfer out of separatist-controlled areas. Ukraine’s Ministry of Education would only issue an evacuation order once an initiative group of students, teachers and administrators had been set up at the university that could take responsibility for the move. Universities would move into their own campuses elsewhere where possible or, if not, negotiate with local authorities over allocation of space. DonNU, for example, was able to move into the former administration building (Russian link) of the Kristall vodka distillery in Vinnitsa. Considerable funds and equipment were left behind in the self-styled republics. “They wouldn’t let us take anything from the university, not even our intellectual property, although we could, of course, take anything we had on our home computers,” says Svetlana Marova, acting rector of the relocated Donetsk State University of Management. According to Aleksey Mozulyaka, pro-rector of Donetsk’s Law Institute, which has relocated to Kryvyi Rih, the move was a real test of institute staff. Universities had to discover whether people would be ready to move away, leaving family and friends behind: “Not everyone could handle it, but the positive side was that those who moved became a solid team. Our people were the only thing we managed to take with us,” he tells me. .In all, 16 universities and 10 higher education institutes relocated, and only two of them to Kyiv — Luhansk’s State Academy of Culture and Arts and the Tavrida National V.I. 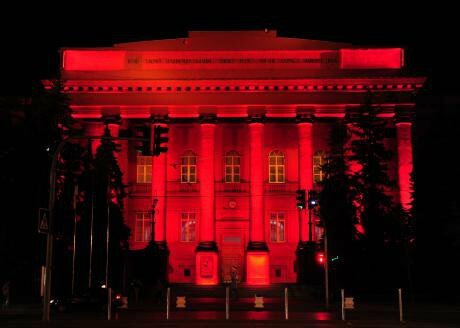 Vernadsky University, which had been based in Crimea. The rest found new homes in Kryvyi Rih, Kramatorsk, Severodonetsk, Kharkiv and other cities. Each university was allocated financing, but to get hold of the money they had to redraft all their official documents, review their staffing structures and renew their agreements with the Treasury — in other words, the funds that were assigned to them, but which were held on accounts in separatist-held areas. These resources only became available to the universities after they had re-registered at their new locations. Teachers at the evacuated universities report that they received their salaries on time and backlogs within a month. However, in 2015 bureaucratic holdups meant that staff (mostly support workers such as technicians, resource staff and secretaries) at Donetsk National Technical University (DonNTU), having relocated to Pokrovsk, had to wait six months for their salaries (Russian link) to catch up with them. 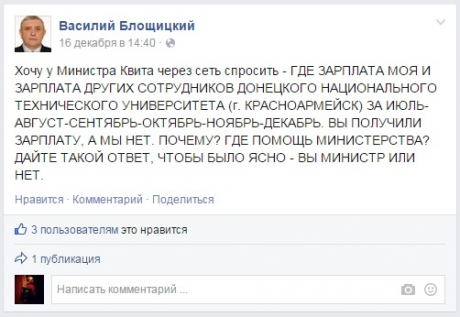 An employee of Donetsk National Technical University turns to Facebook to vent over unpaid wages.According to Kvit, there was no problem about students relocating from other areas. They were accepted over and above the usual student numbers. “During the first semester – up until the end of the year – they could decide whether to stay at their original campus or move with their evacuated university.” In November 2014, the Minister of Education announced that about 5,500 students had chosen to move to other parts of Ukraine. And by 2016, according to the Osvita.ua education website, that number had shot up to 40,000, with 3,400 university teachers also leaving Donbas. In November 2015, the accreditation committee of Ukraine’s Ministry of Education cancelled the licences (Ukrainian link) of all higher education establishments in the separatist-controlled areas of the Donetsk and Luhansk regions and Crimea. And February 2017 saw this fate extended to colleges, technical schools and schools, though the students in question are allowed to receive a Ukrainian education — there is now a procedure of attestation and qualification for students wishing to study further in Ukraine. To receive school diplomas at the end of ninth and eleventh grades, students from the LNR and DNR have to register at an elementary school. This can be an external studies centre, or any school that is set up for distance learning. A student has to visit this school several times a year. Students here are mainly focused on the subjects necessary for passing the state exam, as well as those subjects not taught in the DNR or LNR, such as the history of Ukraine. Students in higher education from these territories can be examined at Ukrainian universities or transfer there, even to the same stage of the course. Ukraine’s education ministry thus allows students to receive their certificates, but only after they pass exams on Ukrainian state-controlled territory. There is no recognition of LNR or DNR diplomas. Ukraine’s decisions regarding accreditation have been a far from popular move in Donetsk. According to Larisa Polyakova, the DNR’s Minister of Education, the decision was motivated by “a desire to get their own back for their own educational failures.” She continued: “our republic has its own accreditation committee and its own state,” and that the Ukrainian education ministry’s decision was irrelevant to education professionals in the DNR. 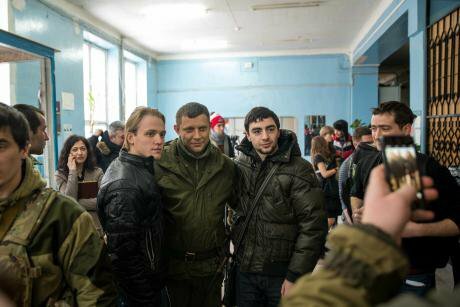 January 2015: the Head of the self-proclaimed Donetsk People's Republic, Alexander Zakharchenko, poses with two students after a press conference at a Donetsk University. (c) James Sprankle/DPA/PA Images. All rights reserved.The unrecognised republic’s own figures put the number of students in the DNR at 74,000, a quarter of whom are studying civil defence and fire prevention at government expense. The LNR and DNR’s Ministries of Education have begun talks about having their qualifications recognised by Russia and making it easier for their school leavers to enrol in Russian universities. In July 2015, Dmitry Livanov, Russia’s Minister for Education and Science, announced that certificates bearing the stamp of the unrecognised republics would have equivalent status to those from Ukraine in terms of both the law and educational accreditation. These young people generally go to universities in neighbouring parts of Russia, such as Rostov, Voronezh and Belgorod regions. There have also been instances when staff at universities in the DNR and LNR have been able to defend their dissertations at Russian universities. In 2015, for example, a few dozen DonGTU students received their masters’ degrees in metallurgical engineering from Lipetsk State University. And in 2016, Russia’s Ministry of Education awarded degrees to 3,000 students from the DNR. 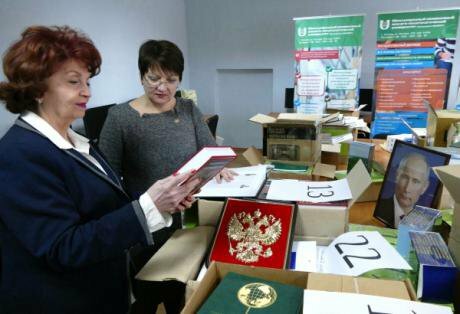 Lidya Omliyanovich, first rector of Donetsk National University of Economics and Trade shows DNR education minister Larisa Polyakova a gift of books from a Moscow institute. (c) Igor Maslov / RIA Novosti. All rights reserved.For residents of the DNR and LNR, however, their choice of university is often affected by their political sympathies and their perception of the region’s future. Three years of war and the accompanying propaganda have led more and more people in the separatist-controlled areas to plan their lives around the realities of wartime. The economic crisis in the area can also leave people no choice: their main hope of income, apart from service in paramilitary forces, is finding casual work in Russia. Education in the DNR and LNR is also drifting in Russia’s direction. But if some students at local universities can simultaneously study for external degrees from Russian universities, they’ll find they can’t use these qualifications to get jobs in Ukraine later. Svetlana’s classmate Kristina is also not planning to leave the DNR — she is a patriot of the unrecognised republic, and starts talking about her education with a bunch of propaganda clichés – “junta” (the Kyiv government), “hit squads” (Ukrainian volunteer battalions) and “ukrops” (right-wing Ukrainian patriots). Kristina, like her parents, believes in a future for the DNR, and calls Ukraine “former Ukraine”. She believes there is no ideological indoctrination in the republic — neither in schools nor in universities — but that regular patriotic events involving separatists are a healthy development. It’s true, however, that education is being militarised on both sides of the frontline. In Ukraine, war veterans visit schools and universities. In February 2017, for example, members of the Azov Battalion (Ukrainian link) met the pupils of Kyiv School No 182 in honour of the third anniversary of Maidan. Volunteer battalions are also engaged in patriotic exercises outside the school system. They organise summer camps and military training courses for youngsters aged 9 to 18. 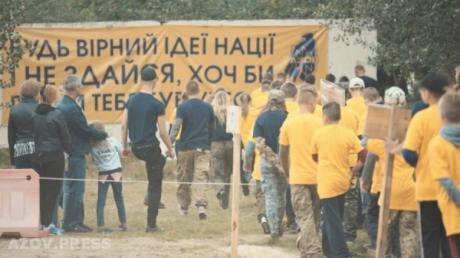 For three summers now, demobilised soldiers from the Azov Battalion have trained children in hand-to-hand and knife fighting, accompanied by lectures on “the ideology of Ukrainian nationalism”, as part of their Azovets summer camp programme. There are no electronic gadgets permitted within the camp grounds, and the kids have access to their mobile phones for just 20 minutes a day to phone home. Other nationalist organisations run similar programmes for children. Azov summer camp for children, Kyiv region, 2016. Source: Azov.Vitaly Sizov, the head of Donetsk’s Institute of Information, sees a parallel between these practices and patriotic education in the Soviet educational tradition. “The Soviet era makes most sense for people on both sides of the frontline, so meetings with ex-combatants are more or less the same for both groups. On both sides of the front line, the people in power are trying to own the symbolic space.” According to Sizov, the fact that children are being brought up in two “opposite ideological worlds” could lead to conflict in the future, but for the moment it’s difficult to assess the real effect of this situation. Most students from the conflict zone have to frequently cross the front line as they go back and forth between home and school or university. Apart from the cost of food and other essentials, for which they rely on their parents, they have no other support — they are in an alien environment, and their chances in the labour market are limited by the lack of jobs. 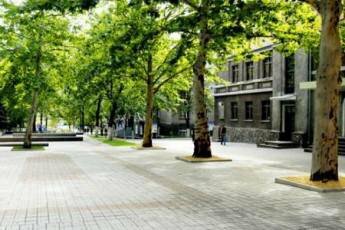 Since the beginning of the war, there’s been little in the way of academic cooperation between the university teachers who stayed in the self-proclaimed republics and those who left the separatist controlled zone. This, doesn’t, however, mean that there has been no informal contact between former colleagues. Those who work in the evacuated universities come home from time to time, and those who work in the DNR and LNR education systems visit Ukraine to sort out their pensions or ID documents, as passports issued by the unrecognised republics have no legal status. This has recently become more difficult: the Ukrainian government has introduced a system of passes to regulate crossings of demarcation lines and the DNR and LNR authorities have also brought in rules for visiting areas they control, all of which seriously limits the freedom of movement of people living in eastern Ukraine. Mikhail believes that students will be able to find a high quality education in either Ukraine or Russia, but the quality of the teaching staff in what remains of the university in Luhansk is not high: students would do just as well educating themselves at home. Both sides are nonetheless fighting to attract students on the future. Ukraine offers students from the ATO zone a support package in the form of free or reduced tuition, a maintenance grant and low interest long term loans, as well as free hostel accommodation and textbooks. School students from the LNR and DLR can also study for their leaving exams externally in Ukraine or via distance learning and have an independent external assessment after passing their exams. The corresponding regulatory body in the unrecognised republics, on the other hand, tries to attract school leavers with the promise of Russian degrees, although the war itself works in their favour. Many residents of the DNR and LNR choose to study at local universities, to avoid the dangers of constant toing and froing across the front line and the problems of living far from home. For local Ukrainian universities, the evacuated universities and institutes have, of course, become competitors in the scramble for school leavers. And given the country’s demographic decline, its low ratings in external independent assessment and Ukrainians’ increasing solvency problems, this competition is becoming even stiffer. Ukraine’s Ministry of Education has, however, no plans to merge the evacuated universities with local ones. In November 2016, president Poroshenko signed a law that legally supported the activities of displaced universities. These universities will retain their status as higher education institutions for the next five years and will not have to seek accreditation after the end of the war. Moreover, a temporary moratorium was put on these universities credit repayments. The law also prevents fines being enforced on universities struggling to repay. This loyal treatment of evacuated universities can be explained on political grounds. If displaced universities were incorporated by local education universities, this would give the separatists grounds for claiming that the universities in the areas under their control are the only ones who can claim the brand of a Donetsk or Luhansk university. Despite Ukraine’s relatively open system of education for residents in separatist territories, the war and economic crisis in the region create unavoidable problems for those in education. Separated by the frontline, people more and more often do not plan their lives or careers long term. On the other hand, a Russian or Ukrainian diploma is becoming a choice of where you will live in the future, at least until the end of the conflict. The natural poverty that comes with war is preventing students from receiving a quality education — for the parents of students from the self-proclaimed republics, moving their children to their place of study costs a significant amount of money. This means that investing in the future of their children is a distant prospect, just like peace in eastern Ukraine.